Cask wins for Overall Best Cocktail Experience and Greenes Restaurant for Best Customer Service at the National Hospitality Awards on Monday 15th October. Cask bar was announced the overall winner for Best Cocktail Experience, with a Best Customer Service Award going to Greenes Restaurant, at the National Hospitality Awards, which are a distinctive and prestigious recognition of the efforts of the very best in the business, at a gala event held in the Shelbourne Hotel, Dublin on Monday the 15th of October. Boutique cocktail and food venue Cask and Greenes Restaurant, together with country house-style Hotel Isaacs, are part of a family of connected venues with beautiful period architecture adjoining one another on MacCurtain Street in the Victorian Quarter of Cork city. 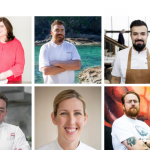 The National Hospitality Awards are judged by industry professionals to a rigorous standard and winners are establishments that have really excelled in both front and back of house. 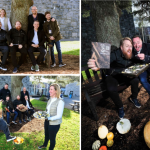 The Overall National Hospitality Award for Best Cocktail Experience is the latest in a breathtaking line of accolades for Cask, which was also announced Ireland’s Bar of the Year, Cocktail Bar of the Year and Contemporary Bar of the Year in August (Bar of the Year Awards 2018). The National Hospitality Award for Best Customer Service is the latest distinction for local-ingredient, fine dining restaurant Greenes and it joins the Munster Hotel Restaurant of the Year award it won earlier this year in addition to multiple previous awards. The bar team at Cask, led by cocktail master Andy Ferreira, has built a reputation for producing the most creative and innovative drinks’ menus in Ireland, with a strict ethos of basing the cocktails around the wild ingredients that grow in Ireland. Sloes, elderberries and rosehips feature on their autumn menu. Bryan McCarthy also designs the local-ingredient menus next door at Greenes Restaurant which honours the outstanding local, in-season and organic produce available in Cork. Dishes are sophisticated, refined and beautifully presented, while innovative preservation and fermentation techniques allow Bryan and his team of chefs to work with local ingredients all year round. An extensive wine list is carefully chosen by Greenes Restaurant manager and sommelier Frank Schiltkamp. Cask and Greenes Restaurant share one of the most unique and stunning outdoor areas in the whole country, prepared for an Irish, all-weather climate with a full canopy and state-of-the-art lift access to both venues in place for guests of Hotel Isaacs. Cask and Greenes Restaurant are located at 48 MacCurtain Street, Cork. For more information, see the websites www.caskcork.com and www.greenesrestaurant.com.